Well, I went into Blockbuster with the intent of getting The Debt (one of the only movies that my darling Jessica Chastain has been in which I've not seen, and I really enjoyed the original) and Immortals. Then I saw Puncture and The Whistleblower - two films I wouldn't mind seeing - sitting there. Due to a bit of homework, I just had to go with The Debt and Immortals like planned, but I shall probably check out the other two tomorrow/next week. Ah, at least we're getting a steady flow of movies through! Yeah, it is another song from The Girl with the Dragon Tattoo's soundtrack. It makes me want to cry every time I hear it. I don't care what everyone else says - that ending was perfect. Ugh, I need to see this magic again. So on Thursday, me and quite a few friends are going to see The Hunger Games. Yes, this is almost as exciting as The Dark Knight Rises. Therefore, on Thursday, there won't be any 'conversations' (sorry). If I get back early enough, I'll be sure to post my review - just because I have a whole one day window on you Americans who haven't had the chance to get to any premieres/previews. This is a rare chance. Mind you, we get The Avengers two weeks before you, so does that mean that NZ is finally moving up in the world? Andrew waves goodbye to 2011 (something I won't be doing for quite some time) with an epic top 10 list. The top four make me squeal with delight inside. Sati gets into the St. Patrick's Day spirit with more clovers than I've ever seen and 16 drinking scenes. Steve @ 1001 Plus does a wonderful review of one of my favourites The Diving Bell and the Butterfly, which is one that both of us aren't keen to see again. Jessica @ The Velvet Cafe's review of The Muppets made me smile just as much as I did throughout that whole movie. I still sing songs from it when I find an appropriate moment. Lesya says that it is never too late to talk about The Artist. Hopefully it is not too late when I finally get to see it in like, 500 years. Tyler looks at some great films under 85 mins. Who doesn't like a short movie? Who has read The Hunger Games book/s? Sorry to burst everyone's bubble, but you won't be hearing a word from me about the frickin' HUNGER GAMES. Another franchise for me to completely ignore! :) Gah, I'm awful. Thanks for the linkage too. But believe me, The Hunger Games is awesome. Seriously. Have to agree with Tyler on this one, too. I've read the first Hunger Games mind you, but, being someone who loves Battle Royale (the film and comic, haven't finished the book yet), it just felt like a rip-off of it from start to finish. I will see Hunger Games but I won't fight for a ticket for the opening night. I'll leave that to my daughter and her friends. Thank you for the link love from a fellow muppet fan! I HAVE SEEN THE HUNGER GAMES AND I LOVED IT!!!! YAY! I cannot wait to see your review. Thanks for the link! I must be the only person who is not at all excited about The Hunger Games :) I hope you'll like The Debt! Haha, you probably are, but it is going to be awesome! And The Debt was reeeeeally good! The Debt is what I want to see. I also want to re-visit The Girl with the Dragon Tattoo. I haven't made any 2011 lists but it would have been in my top 5! I'm excited about The Hunger Games! That's so cool it seems that everyone has it on the same week. And no, I haven't read the books, but I'm interested (even though it says they are targeted at teens -- whatever, I'm still young lol) and I didn't want to spoil it until I see the movie. Thank you very much for the plug! I really want you to see The Artist. Is it known when the DVD is released in NZ? The Debt is very good - a must see! I think Dragon Tattoo is in my top 10. I'm not sure - I'll have to actually make up a proper list. The Hunger Games is awesome no matter what the age. I really enjoyed the book. It should be released in January, but they keep expanding it so I'm not sure it will come out here. I really enjoyed The Debt for Jessica Chastain. Hope you do too Stevee! 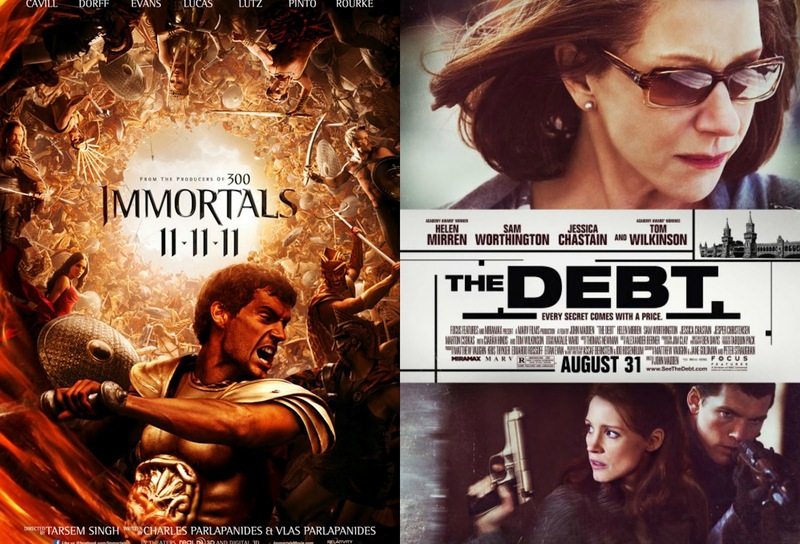 Immortals is pretty entertaining but yea, fairly forgettable too. It was really good. Much like the original. And Immortals was pretty to look at, but I was so bored! Who has read the Hunger Games books? *Diana quickly raises hand with excitement* Me, me, I have and I loved them! :)) haha. Well, they weren't the best thing I have read in my life, but they are very entertaining and a real page turner, especially the first two; I was dissapointed by the third one! I can't wait to see who they cast as Finnick, I am keeping my fingers crossed for Garrett Hedlund, he's been on everyone's list from the beginning and most of the fans seem to approve of the choice- let's hope Gary Ross likes him, too, and asks him to audition! I've heard the third one is pretty disappointing. I've yet to go to the second one - I started reading it, but then I got really busy, so I gave it to someone else. I'll get there one day, though!